Drawing on generations of Spanish guitar-making tradition, we carefully chose quality materials for incredible sound, and prioritized comfort, playability, and attractive aesthetics to create truly inspiring instruments with which students can effectively learn and grow. 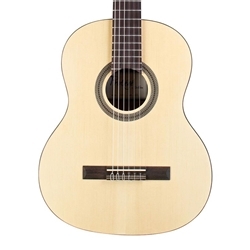 The C1M 1/2 is the perfect 1/2 size nylon string guitar for any aspiring guitarist. Part of the Protege by Cordoba line, the C1M 1/2 was developed to provide young players with a comfortable, great sounding first guitar at an affordable price.